Range: Tidal portions of Merrimac River, St. Lawrence River, Kennebec River, and Hudson River. Also listed as rare in Connecticut and Massachusetts; does not occur elsewhere in New England. Aids to Identification: Bur-marigolds are herbaceous plants with yellow daisy-like or button-like flowers and opposite leaves. The term "bur-marigold" refers to the "sticktight" fruits which attach themselves readily to clothing or fur. B. eatonii differs from other Maine bur-marigolds in the following combination of characters: the leaves are simple (as opposed to compound); the leaves are stalked, with the stalk (petiole) somewhat winged; and the largest heads are few-flowered (7-30 flowers). 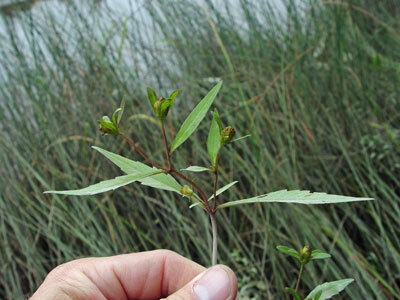 Other similar species which could occur in Maine estuaries have compound or sessile leaves or broader flower heads, with at least the terminal head having 30-150 flowers. The species is divided into several varieties by some botanists. 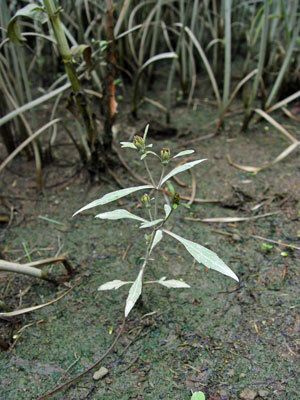 Ecological characteristics: Bidens eatonii is characteristic of brackish estuaries and occupies the upper intertidal zone. In some cases it has been found with the also rare Bidens hyperborea (which has sessile leaves). Phenology: Flowers August - September. Synonyms: Bidens eatonii Fern. var. fallax Fern. ; Bidens eatonii Fern. var. interstes Fassett; Bidens eatonii Fern. var. kennebecensis Fern. ; Bidens eatonii Fern. var. major Fassett; Bidens eatonii Fern. var. mutabilis Fassett; Bidens eatonii Fern. var. simulans Fassett; Bidens heterodoxa (Fern.) Fern. & St. John var. athesitica Fern. Known Distribution in Maine: This rare plant has been documented from a total of 13 town(s) in the following county(ies): Kennebec, Lincoln, Sagadahoc, York. Reason(s) for rarity: Range naturally restricted, at its northern limit. Also listed as rare in Connecticut and Massachusetts; does not occur elsewhere in New England. Conservation considerations: Prevent degradation of saltmarsh and estuary habitat from adjacent land uses.